The My Sister Sam TV show was a 30 minute comedy series on CBS about a 29-year-old female, free-lance photographer (Sam) whose 16-year-old sister (Patti) moves from Oregon to live with her in San Francisco. Much of the series centered around Sam's difficulty in being both a big sister and a "mother" to Patti and balancing her social/professional life with her "motherly" duties. Twelve episodes of My Sister Sam were produced but did not air when "My Sister Sam" was canceled. Their titles were, "It's My Party and I'll Kill If I Want To", "Good Neighbor Sam", "Patti, I Have a Feeling We're Not in Oregon Anymore", "The Art of Love", "Camp Burn-out", "Grand Prize", "Walk a While in My Shoes", "The Wrong Stuff", "The Thrill of Agony, the Victory of Defeat", "The Good, the Bad and the Auditor", "Earthquake", "A Day in the Lives". Contrary to popular belief, "My Sister Sam" was not canceled due to the muder of 21-year-old Rebecca Schaeffer. The series was canceled long before her tragic death on July 18, 1989. Rebecca was a beautiful and talented young actress who probably had a very successful career ahead of her when she was shot by a crazy young man who had been obsessed with her for at least three years and eventually began stalking her. Rebecca's murder resulted in stalking being upgraded from a misdemeanor to a felony in California and also caused the enaction of laws to protect the public records of celebrities (such as driver's license information) to make it more difficult for crazy people to find their addresses, etc. 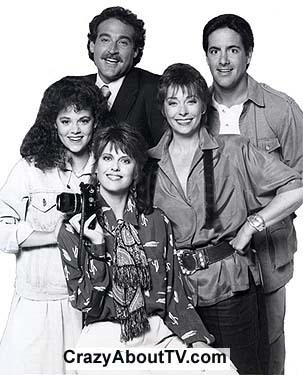 Rebecca lived with co-star Pam Dawber and her husband Mark Harmon during filming of "My Sister Sam". Title: "Room Enough For Two"
Thank you for visiting our My Sister Sam page!